How do you feel when you go to the dentist? If you’re like most people, you’re probably a little nervous, or you may actually be scared. 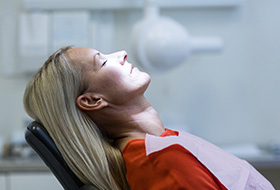 At our office, we’re able to help our most anxious patients relax thanks to sedation dentistry. Using the techniques outline below, we can help calm your mind and protect you from pain all at the same time. If you would be interested in using dental sedation at your next appointment, simply contact us today. Nitrous oxide is a colorless, odorless gas that has been used to help dental patients of all ages relax for well over 100 years. At our office, you’ll simply inhale it through a small nasal mask, and within minutes, you’ll start feeling light, happy, and maybe even euphoric in the chair. We can adjust the amount of nitrous you receive during your appointment to keep you comfortable the entire time. Plus, once we remove the mask, the gas’s effect will wear off almost instantly, allowing you to go straight back to your day. If you experience more acute dental phobia, Dr. Rairigh can prescribe you a sedative to take about an hour before your scheduled visit so that by the time you reach our office, you’ll already be deeply physically and mentally relaxed. You’ll remain awake and be able to respond to commands, but time will seem to fly by very quickly, and you’ll likely have little memory of your visit after (which some patients prefer! ).